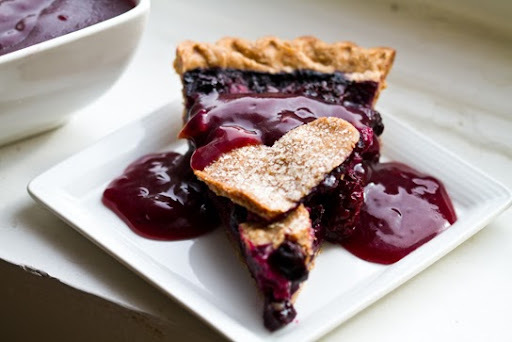 My Black and Blueberry Heart Pie (with a sticky berry sauce) is the Valentine's Day dessert for everyone. 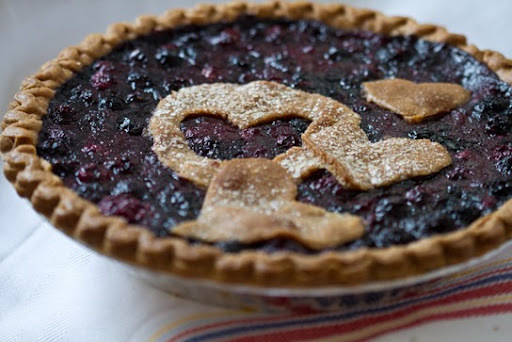 Because even if you don't have someone to snuggle up to, at least you can have some darn tasty vegan pie. Get my recipe.. I have a love/hate relationship with Valentine's Day. Sure, I love to be showered in Cocoa-V vegan chocolates from my husband and asked to a fancy date night out to dinner (see my VDay plans featured on Meet the Shannons). ..But there is always that little thought scratching in the back of my head: "wait, why does there have to be a day to celebrate love? Isn't Valentine's Day everyday?" (eye roll) Then I take another bite of my Cocoa V truffle (oo! Coconut Cream!) and I'm back to loving Valentine's Day. Valentine's Day: It's not fun for everyone! Even though I am sickeningly in love with my husband now, I do remember those sad VDays spent at home. Alone. Or with other boyfriendless girlfriends, partying the night away saying, we don't need boys to be happy! Ha. That didn't last long. And don't you fret my Valentine-less souls, Love always finds a way. Just give it time. 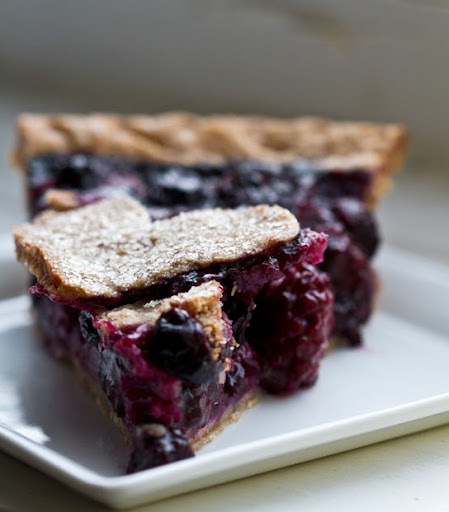 Crust Note: To make this pie super simple I used a pre-made spelt pie crust. But I must admit, I was missing my homemade crust greatly. So if you have time make your own vegan pie crust. 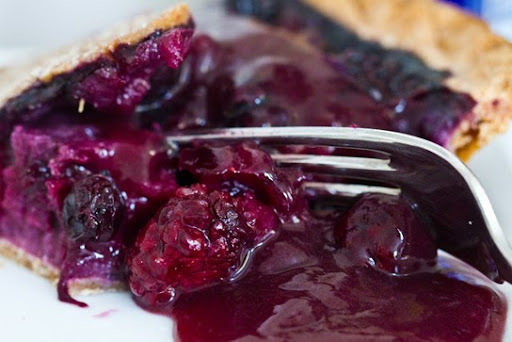 I am in love with the super easy berry sauce that tops this pie. 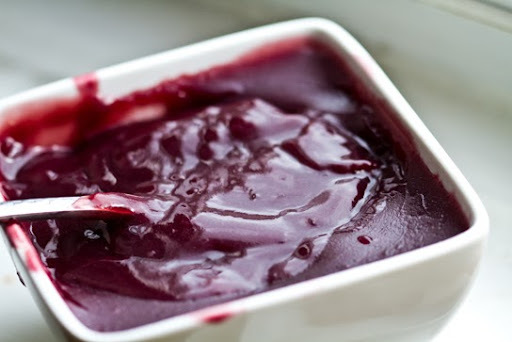 I also featured this sauce with tart cherry juice in this pudding recipe (cherries/chocolate)on Babble. seasonality note: if you want to stay seasonal and use pears or apples instead of berries, go for it. 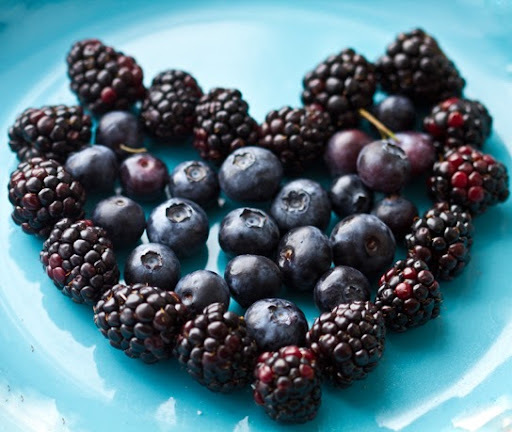 However, the baking time will vary for different fruits...and the black/blue heart theme kinda goes out the window. 1. Dissolve the corn starch into the cold liquid in a soup pot. Place over high heat and add the filling ingredients. Stir continuously until bubbly. Reduce heat and continue stirring. 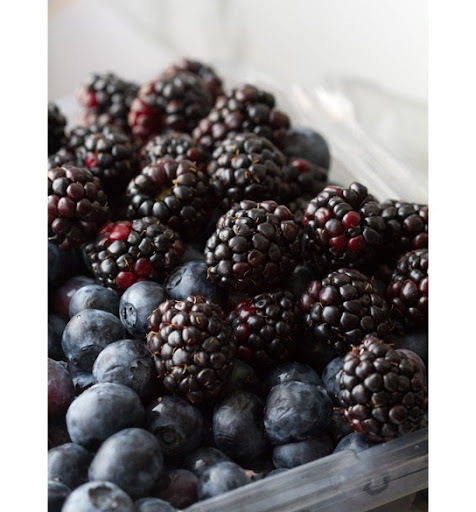 Mash a few of the berries with a fork. 2. When the mixture starts to thicken to a yogurt consistency, remove from heat. 3. 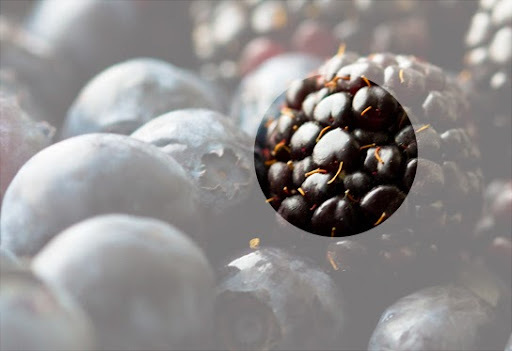 Pour filling into your pie crust. 4. 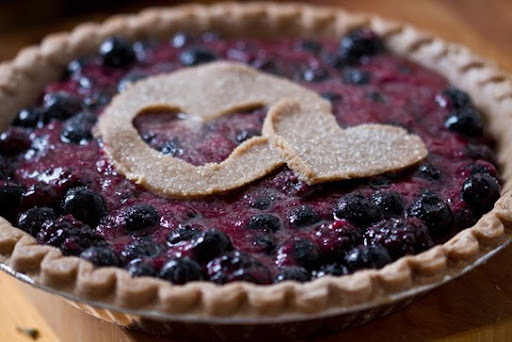 Top with heart cut-outs from additional pie crust dough. 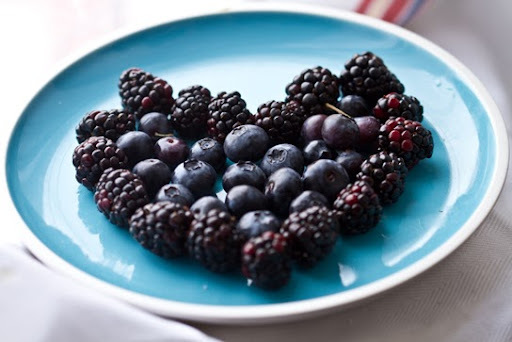 You don't need a fancy cookie cutter to make hearts. I cut mine by hand with a butter knife. 5. Top with a spray of cooking oil and a pinch of sugar. 6. Bake for 15 minutes at 400 degrees. Reduce heat to 350 and bake for an additional 15 minutes. 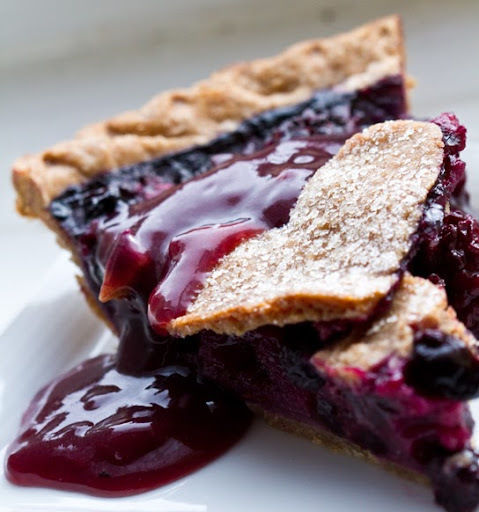 This pie will bake relatively quickly since the filling has already been heated. 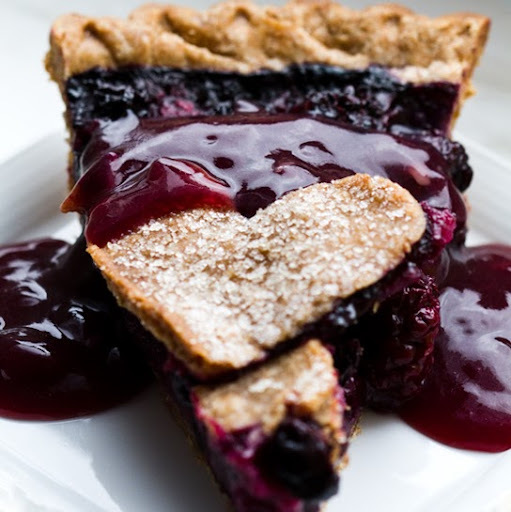 Allow pie to cool. 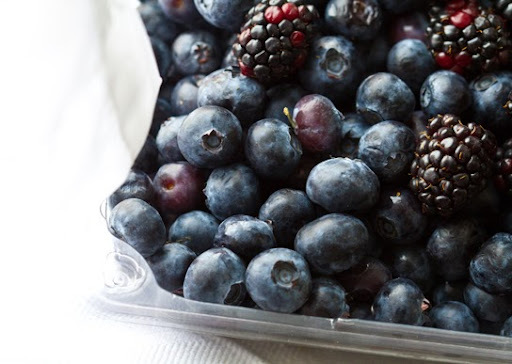 Set aside or in fridge. 7. 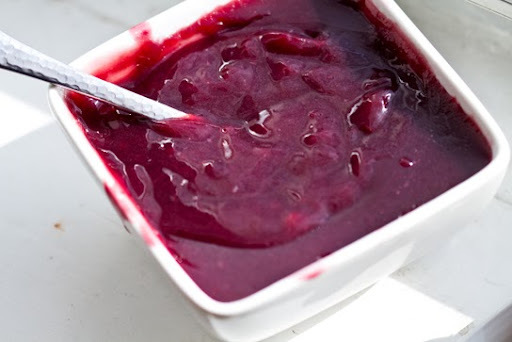 Make your berry sauce topping. This is easy. Simply dissolve the corn starch into the cold juice and heat in your same soup pot (its OK if a few berries are leftover). Stir and heat until mixture thickens. (I like to pour the warm sauce over chilled pie).